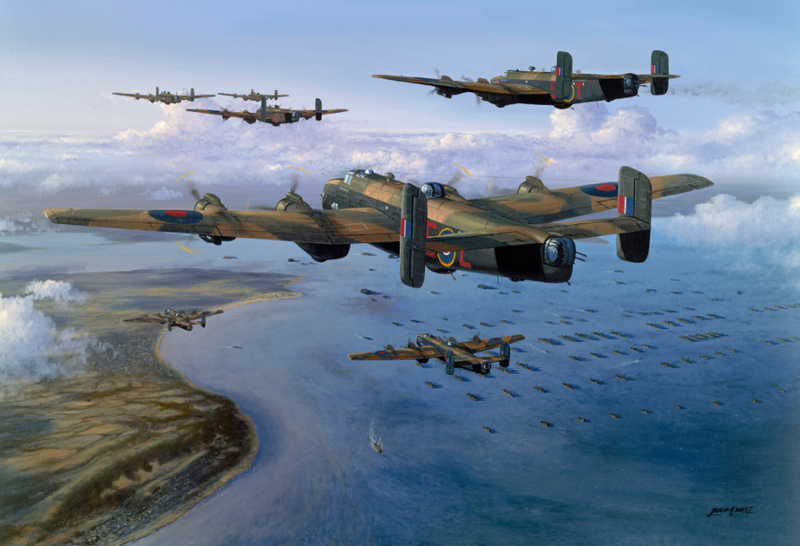 Philip West pays tribute to RAF Bomber Command and the mighty Halifax. It’s the 4th June 1944. RAF Halifax Bombers of 431 Squadron are tasked with a daylight mission against enemy gun positions at Calais and coastal batteries at Merville-Franceville-Plage. The targets were marked by Pathfinder Mosquitos and bombing Accuracy was very good. The raid was in fact a feint for the D-Day landings which took place on the 6th June. On the return flight to their home base at Croft Aerodrome in Yorkshire, the crews had orders not to fly East of Southampton, and as they neared the Isle of Wight, they were rewarded with the spectacular sight of the Allied invasion fleet gathering for what proved to be one of the most significant and historic events of the second World War. George Dunn enlisted in the RAF in January 1941, and was called up in June of the same year. He was allocated to RAF Bomber Command and trained as a pilot in the UK and in Canada (under the Empire Air Training Scheme). In May 1943 he was briefly attached to 10 squadron and then to 76 squadron based initially Linton-on-Ouse and then at Holme-on Spalding-Moor in Yorkshire, part of 4 Group Bomber Command. Between May 1943 and October 1943 George took part in air operations against targets in Occupied Europe and Germany, completing his first ‘tour’ (30 operations) two weeks after his 21st birthday. During this time he took part in a number of ‘significant’ raids, including Hamburg and the V weapon research facility at Peenemunde. After a period instructing (which could be almost as hazardous as operations!) he converted to flying Mosquitos and flew with the Light Night Striking Force flying nuisance and diversionary raids, and later with the meteorology flight flying solo sorties to obtain advance weather data for planning raids. Overall Print Size: 20” x 27½ / 51 x 70cms. Website by www.RocXa.com. valid XHTML and CSS.